The last twenty-four hours have been Sufi-filled, and so that is what I want to post about today. 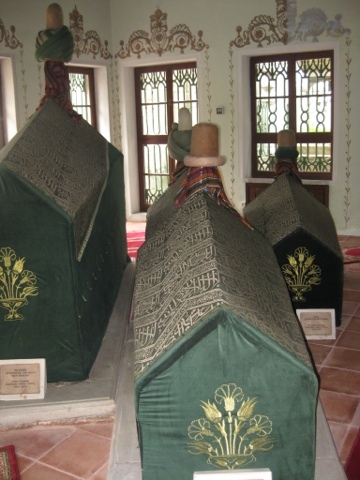 Sufis [Sufism is called “tasawwuf” in Arabic] are generally described as Islamic mystics–although some more conservative strains of Islam do not recognize them as legitimate practitioners. They are not a separate “sect” of Islam–Sufis can be Sunni or Shi’a, for example–and instead represent a dimension of Islam that pervades it. [Some Islamic scholars call it the “inner” or “esoteric” aspect of Islam.] 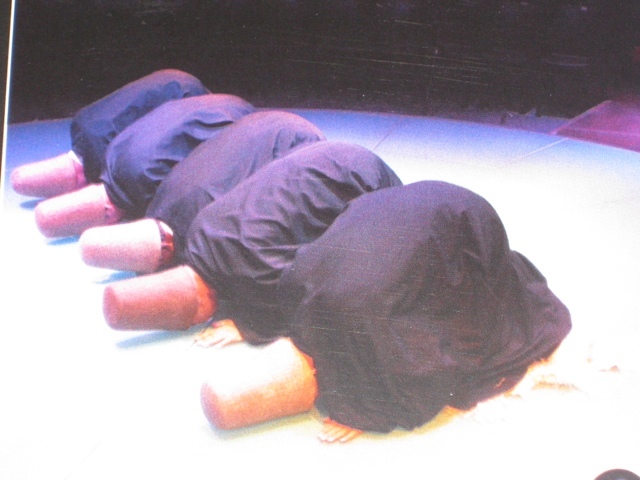 While Sufis follow the Qur’an and the teachings of Muhammad [indeed, they consider themselves to be directly in line with Muhammad], they are not concerned with obedience to “external” rules and regulations and instead seek a personal experience of unity with God: a direct experience of the Divine that is achieved through repeating the name of God, meditating on God’s ubiquitous presence, and breaking one’s attachments to the world. Sufis emphasize the teacher/student relationship, and usually it is not believed that one can learn how to be a Sufi by reading a book! Instead, one needs to study and practice with a recognized Sufi master. 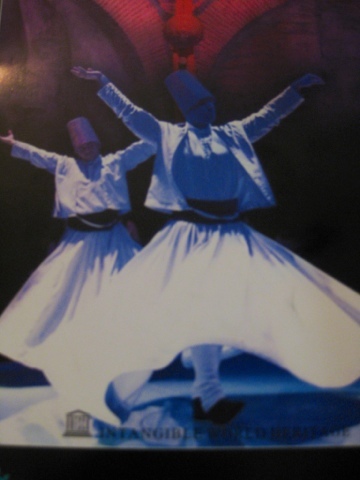 There are many different orders of Sufis, but the one that is probably the most famous is the Mevlevi order, the “whirling” order. This order was founded by a son & a disciple of the famous poet/scholar Rumi [whose full name is Celaleddin Rumi–“Mevlana” is an honorific], who lived from 1207-1273. In this order, the particular means by which the disciples [“dervishes”] seek union with God is not only through more traditional means of study, fasting and prayer, but particularly through a complex litany of twirling, called the “Sema.” The Sema [which is heavily advertised to tourists here–more about that in a minute] is a 700 year old ritual that involves specific movements, music and chanting. 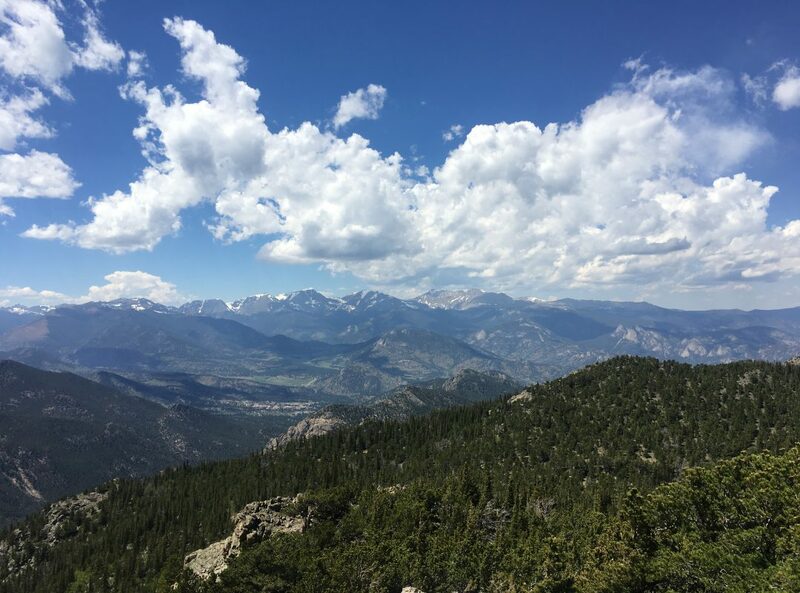 It is an active, vigorously embodied meditation–that’s how I think of it [and why I love it!]. When you hear the name “whirling dervishes,” you might immediately think of the reckless spinning you did as a child in your backyard, twirling around and around until you fell down dizzy. Suffice it to say that is NOT what the Sema is about! Instead, it is a highly ritualized series of movements, each of which carries deep religious meaning. For example, the right hand faces up, representing what one receives from God, and the left hand faces down, representing what one gives to humanity. The ceremony as a whole represents a mystical journey of humanity to God; and there are four specific periods of “whirling,” called “selams” or “salutes.” They represent the stages of humanity’s ascension to God and the purification of the soul. During the Sema they shed their black cloaks, which represent their worldly attachments–their tomb, and twirl in all white garments, which represent their burial garments. 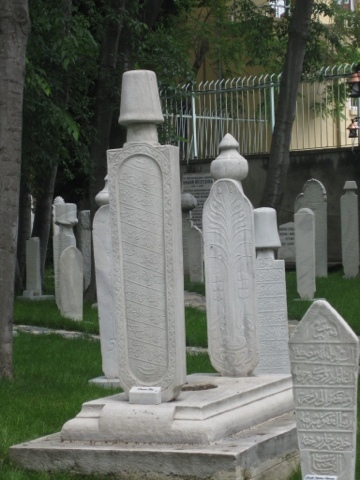 The special hat they wear represents the tombstone. 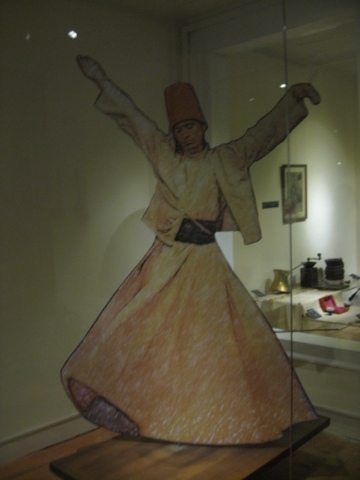 It actually takes over a year for a dervish to learn how to whirl properly–not only the physical technique, but also the mental focus: they repeat the name of God constantly, which keeps them from getting dizzy or losing their balance. Now, back to the tourists. 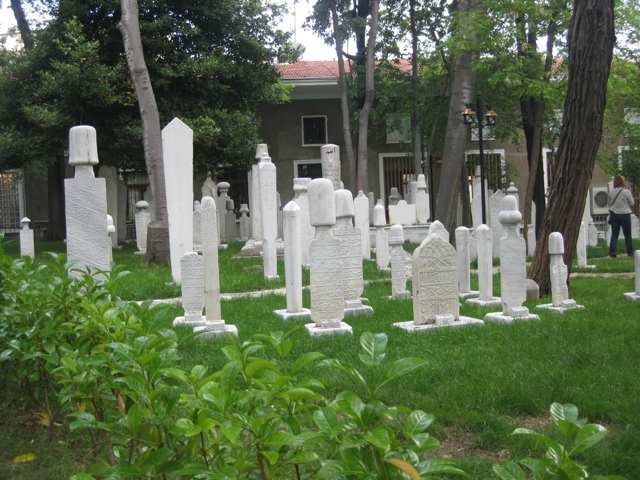 When the modern state of Turkey was founded, all Sufi lodges and practice were abolished. 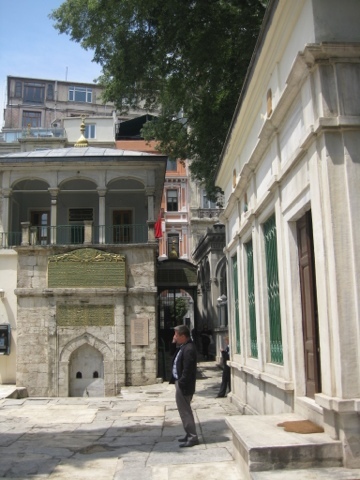 This included the Mevlevi Monastery in Beyoglu. The way in which both the monastery and the Sema has survived in Turkey is by being seen as a historical/cultural treasure [the monastery was converted into a museum]. So, the Sema ceremony, which, as I said, is heavily advertised, comes under the auspices of the Education and Culture branch of the Turkish government. 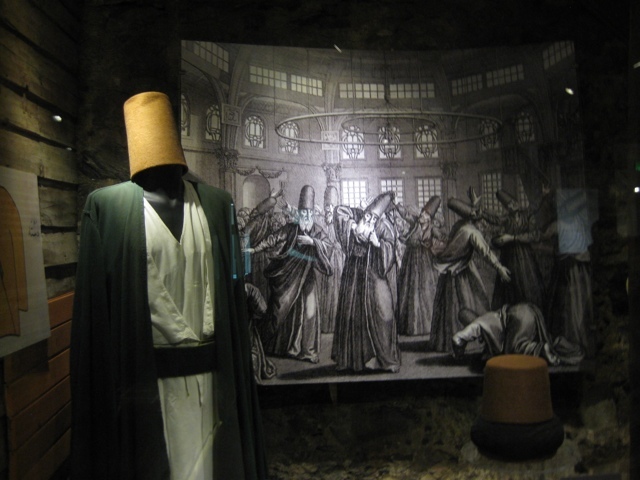 It is clear that this is a religious ceremony–they specify no clapping and no photographs–but since Sufi orders are still technically prohibited in Turkey, they have to have special permission to perform the ritual, and the sufis themselves have secular careers and families. The pictures below come from either the printed materials or the museum, which I visited today (which included several mausoleums and a cemetery). The ceremony itself was amazing last night, and I was happy to have had the chance to see it. 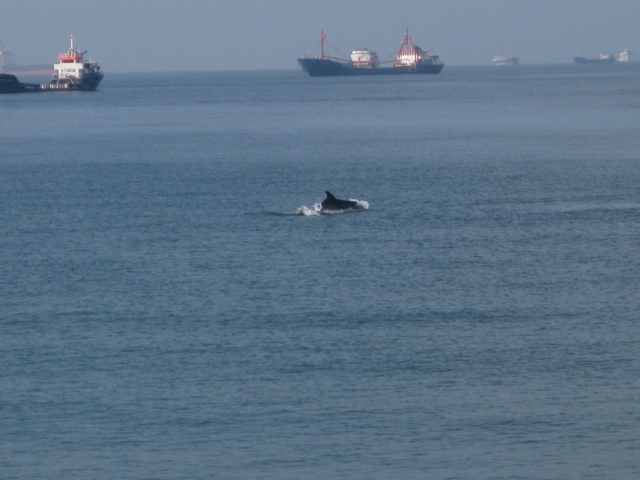 Finally, apropos of nothing, I saw some dolphins on my run this morning–such a fabulous gift from God. I only got one good picture–they’re fast!